On an America’s Cup raceday, it is fitting to show something on the water. 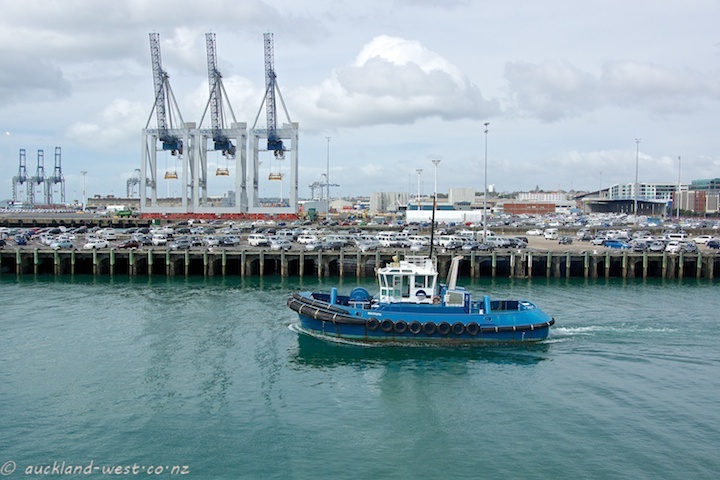 The blue tugboat, seen from Shed 10, with the imported cars behind on Captain Cook Wharf, and container cranes at Bledisloe and Fergusson terminals further back. It is always fascinating to see how these boats can turn on sixpence (or a dime, if that’s your currency). Emirates Team New Zealand have just won race 11 in San Francisco, one more win and they will have the America’s Cup – in less than an hour, maybe?